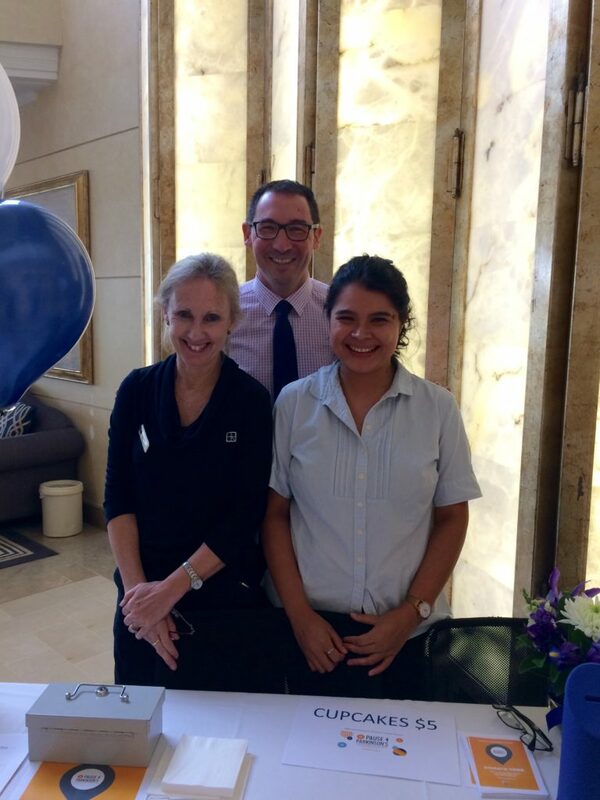 Thank you staff and visitors to North Shore Private Hospital for supporting Shake it Up Australia Foundation for Parkinson’s Research on World Parkinson’s Day. 100 beautifully decorated cupcakes on our cupcake stall sold out in no time! All monies raised at the yearly April 11 World Parkinson’s Day fundraiser go to Shake it Up Australia Foundation to support the amazing work they do for Parkinson’s research. As the carer of a loved one or friend with Parkinson’s Disease, you make a tremendous difference. Being a carer can be exceptionally fulfilling but also highly demanding. Fortunately, there are a number of strategies and support networks available to help you provide the best possible care, and look after yourself too. Chances are, you won’t be the only person involved in your loved one’s care. Speaking to the other support staff and carers to determine your responsibilities can help you to define exactly what’s expected. Writing down your key roles and those of others can help to create a sense or order and make it easier to know who to turn to when new challenges arise. As the condition of the person you care for changes, your role as a carer will change, too. You may need to learn more about dispensing medications or become more involved in daily activities such as dressing, eating and washing. Being ready for change can make transitions feel easier. Make sure you take time away from your caring duties to focus on your health and have regular ‘you’ time. Life as a carer can be difficult and overwhelming, and you shouldn’t feel guilty for taking a break. If necessary, consider enlisting the help of other family members or bringing others in to help you in providing care. You may wish to talk to the doctor treating the person you care for if you need assistance with your caring duties or if you are feeling overwhelmed. Speaking privately with your own doctor can be helpful too. In Australia, you can talk with the GP of the person you care for about setting up a Government funded Aged Care Package or (for younger patients) about a support package through the National Disability Insurance Scheme. There are many private organisations that can also provide assistance if this is affordable. Often, carers are reluctant to seek out or accept outside help, but usually extremely relieved when they do. Sometimes just a few hours of regular, reliable respite can make a wonderful difference for both you and the person you care for. Knowledge is empowering. Learn more about Parkinson’s Disease so you can anticipate changes in the symptoms or behaviour of the person you care for. As a carer, you may find that knowing what to expect at different stages of the disease can help you to manage new situations as they arise. As the carer, you don’t have to do everything all the time. Talk to the person you care for about how involved they want to be in their care, and encourage them to do what they can. If necessary, you might allow for more time to get these tasks done, so that they can maintain a level of independence for as long as possible. 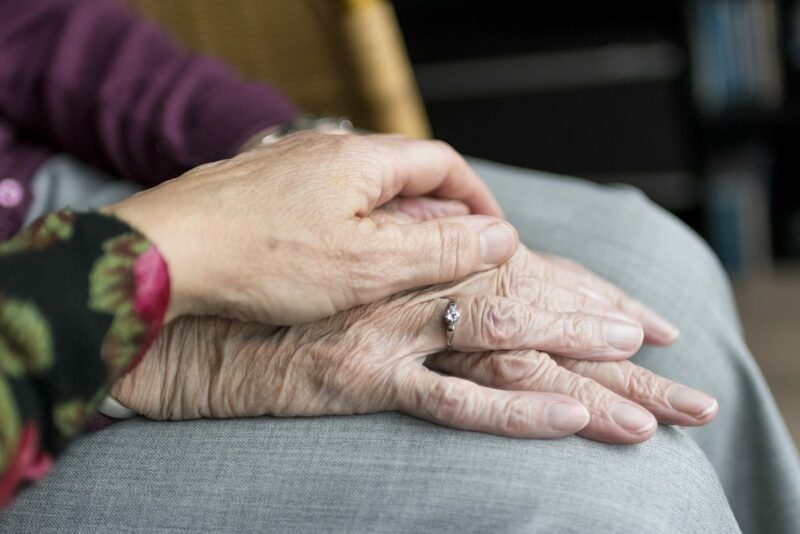 If you’ve been diagnosed with Parkinson’s Disease, you might be wondering about whether it’s safe to continue travelling – both at home, and overseas. The good news is that most people living with Parkinson’s disease continue to be able to travel for many years after the diagnosis. Parkinson’s disease might mean you need to plan your trip in more detail than you have previously. Here are some tips that you may find helpful for planning your vacations and staying safe while you travel. Before you book a holiday or short trip, you may wish to talk to your GP or specialist about your condition and ask if there is anything specific you need to keep in mind. Consider asking your doctor to write a letter about your condition in case you need to visit a doctor while you’re travelling. You may wish to arrange to have this letter translated into local languages if you’re travelling to countries where English is not spoken. Learning how to translate Parkinson’s Disease can also be a helpful step to take before you travel. Consider obtaining a written list of your medications from your doctor or pharmacist. You might also want to investigate how to access medical services particularly if you are travelling to more remote or non-English speaking destinations. Booking your accommodation and transport in advance can make travelling less stressful. If you are using a travel agent, you might want to ask about special assistance for people with Parkinson’s disease. If you are flying to your destination, it’s worth thinking about whether it would be best for you to fly without a stopover, or if you would find it easier to break up your trip. Location of hotel rooms – some people with Parkinson’s disease prefer to request ground floor rooms or rooms close to the lifts. Rooms with extra space – wheelchair accessible rooms often provide more space, particularly in the bathroom. Travelling to and from airports – plan your transport to and from the airport. Travelling within airports or shipping terminals – using a wheelchair to travel through security, customs and immigration can reduce fatigue. Many airports provide ground staff that are able to assist with this. Driving – if you are able to drive, check any restrictions in local areas. Travel insurance is important for all travellers, but it can be especially important for travellers with special needs. Consider talking to your insurer about your Parkinson’s disease, and enquire if there are any restrictions on your insurance cover. The extent of cover can vary widely between insurers, and you may find it useful to shop around for a policy that best covers your circumstances. 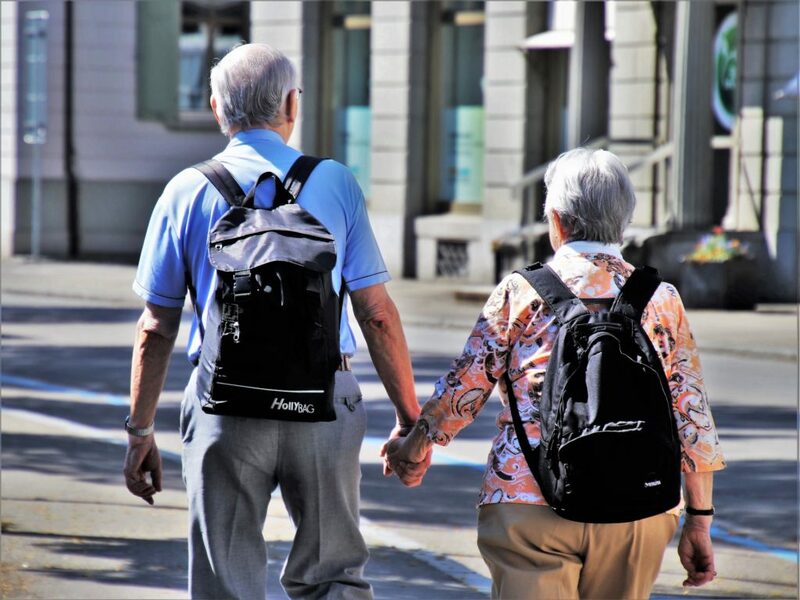 Confirming your plan covers you for Parkinson’s disease internationally as well as locally can give you peace of mind before you travel, and can be very important in the event of an accident or illness while you are away. If you’re driving, find out about car parking and how close this is to the transport terminal. Sketching out a rough itinerary can be helpful in thinking out if there is anything that might make it difficult for you to get around. If you’re driving, find out about car parking and how close this is to the transport terminal. Talk to your doctor about how to take your medications while you’re travelling, particularly across time zones and consider finding out how to access medication overseas if necessary – including any restrictions you need to be aware of. A back up supply of medication is always a good idea. For aircraft travel, you may wish to consider separating your two sets of medication between your carry-on bag and stowed luggage. The information provided in this article is of a general nature only and is not treatment advice. Recommendations regarding therapy can only be made on a case by case basis, discussed between a patient and their treating doctor(s). The information in this article was current at January 2019. 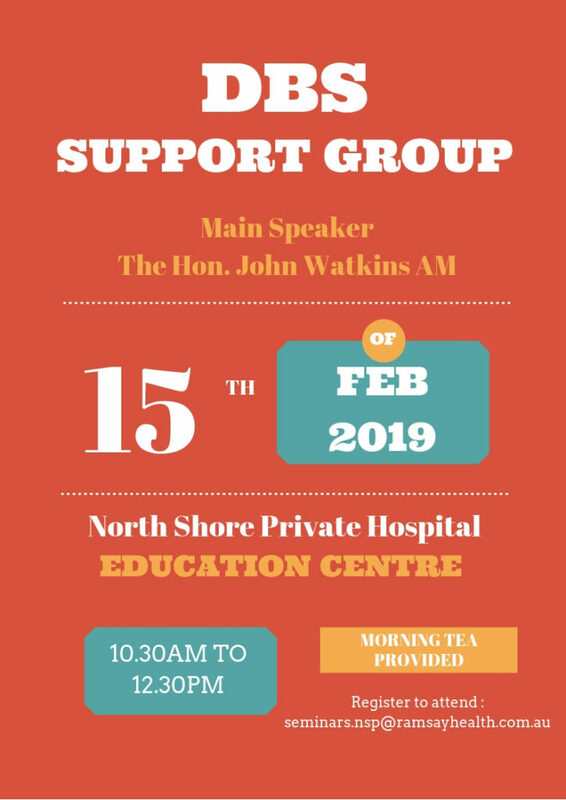 North Shore Private Hospital are hosting a Deep Brain Stimulation Support Group on Friday 15 February 2019 at 10.30am. Those that have had DBS surgery as well as those considering DBS or require more information are very welcome. The main speaker will be The Hon. John Watkins AM. John had DBS surgery in early 2018. Movement Disorder Neurologist Dr Paul Silberstein and Neurosurgeon Dr Raymond Cook will also be in attendance to answer questions. Morning tea will be provided and the meeting will run for approximately 2 hours. 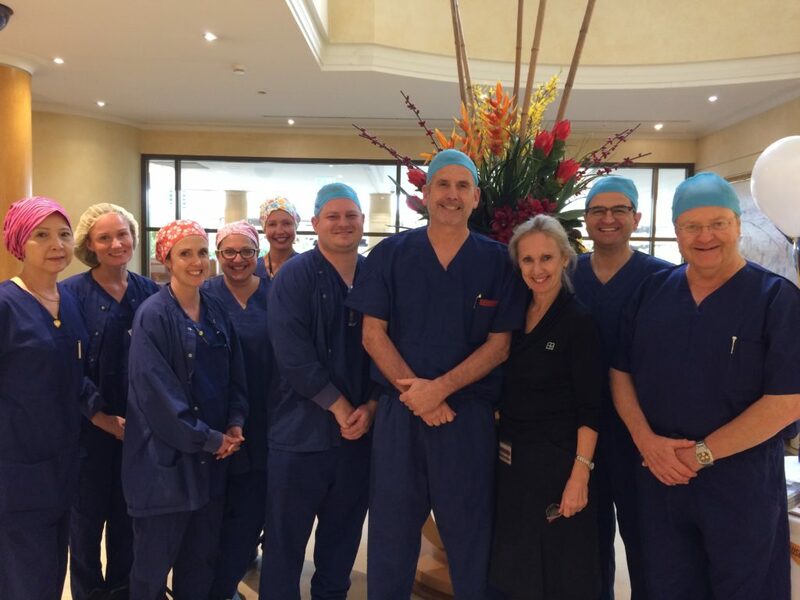 Enjoy a morning listening to John Watkins speak about his Parkinson’s disease journey and after, have the opportunity to share personal experiences, ask questions, learn more about DBS and meet others who have had DBS surgery for their PD. What are my public transport/parking options for getting to and from North Shore Private Hospital?